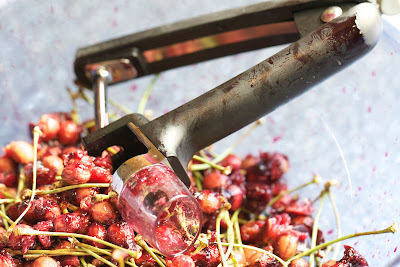 OXO sent me their brand new cherry pitter and so when I saw cherries were on sale I grabbed a whole bunch and figured I might as well put her to the test. I've actually never even had a cherry pitter before so I don't really have anything to compare it to, but it worked like a charm. Place it in the little space, push the handle and thunk goes the seed into the bowl. I got all 8lbs pitted in about 20 minutes. Look at the handle. Doesn't it look like blood stains? 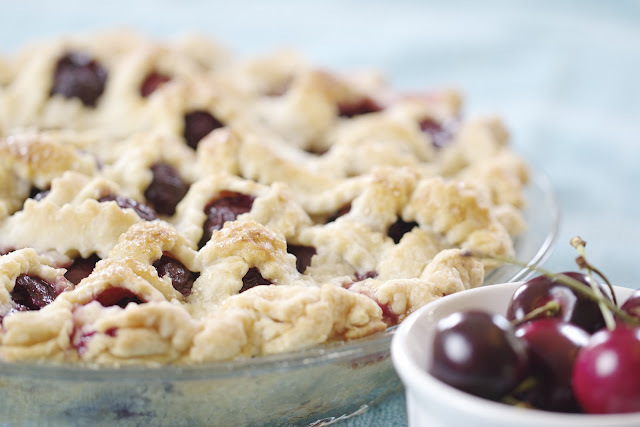 I went back and forth on which recipe to share first, and I finally decided on this classic cherry pie. It's been ages since I've had one and it just sounded so good. 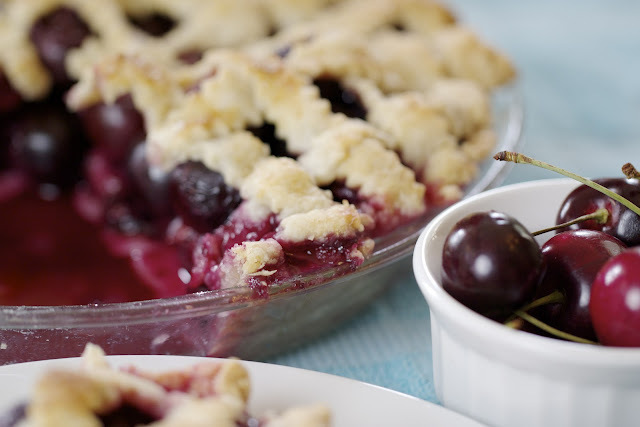 Classic cherry taste without pretending to be anything else. What else can I say? 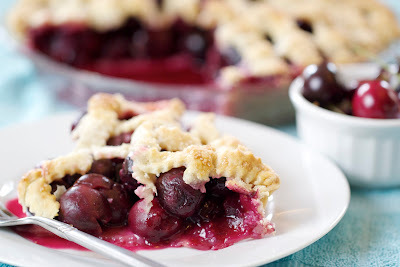 Just make it and enjoy this time of year when cherries are plentiful and cheap! Also, some tips for making an amazing crust that I learned at King Arthur Flour. Cut in the butter, half at a time. The first half, cut it in until it resembles small peas. For the second half, cut the butter into about 1/2 inch squares before adding to the flour. Using your fingers, press the squares until they flatten out. 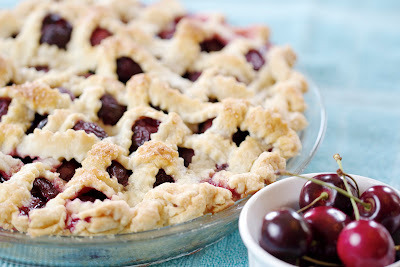 Leave these as large flat pieces and you'll get a nice flaky crust! Roll out half the dough on a floured surface. Line the bottom of a 9 inch pie dish. Trim the dough against the dish. Roll out the second half into a large rectangle. 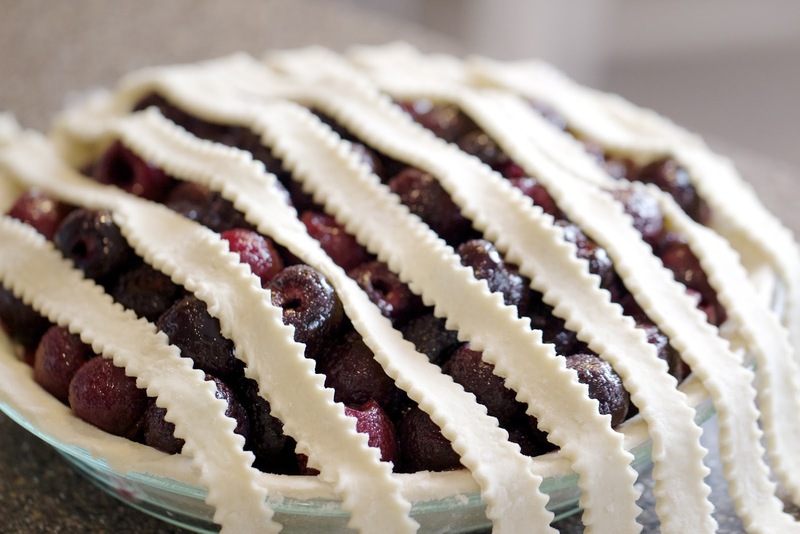 Using a sharp knife or pastry wheel, cut long 1/2 inch strips out of the dough. Lay about 8 of the strips across the pie in one direction. 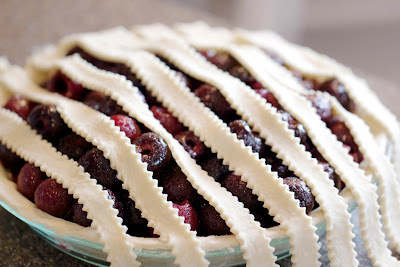 Fold back every other strip halfway across the pie. Lay a new strip across the other direction. 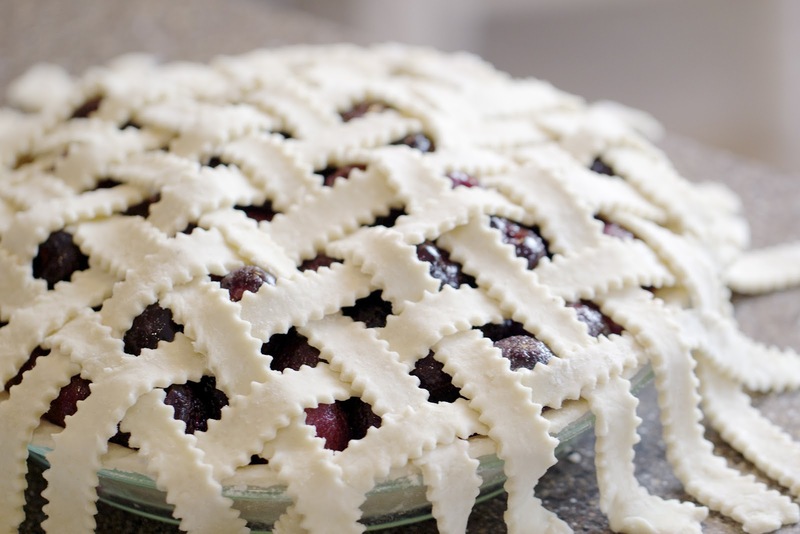 Fold strips over and then repeat with the other strips adding a new strip each time until you get to the edge of the pie. Repeat for the remaining half. Seal the strips underneath the crust and crimp the edges. Place pie on rimmed baking sheet and bake 15 minutes. Reduce oven temperature to 375°F. Bake pie until filling is bubbling and crust is golden brown, covering edges with foil collar if browning too quickly, about 1 hour longer. 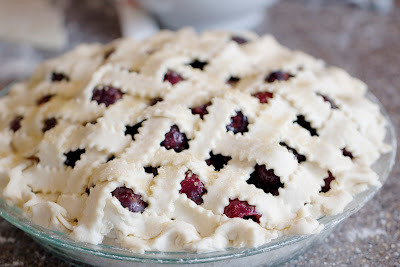 Transfer pie to rack and cool completely. 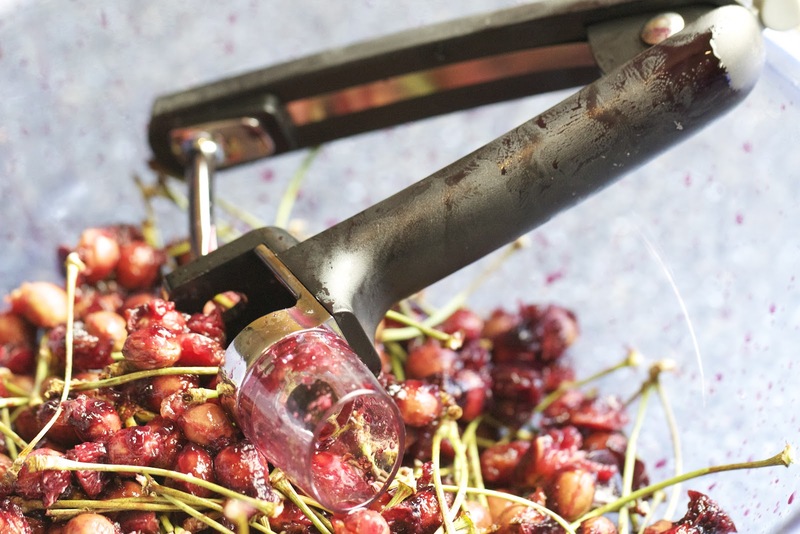 The OXO cherry pitter is the best! 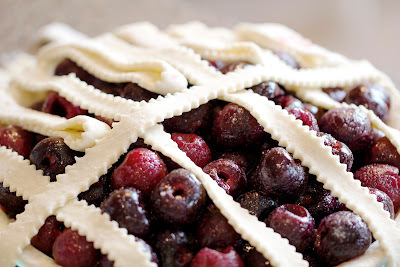 Beautiful pie, I love the lattice top. Gorgeous AND impressive... of course! That looks almost to good to eat. The crust looks great and the filling looks scrumptious. 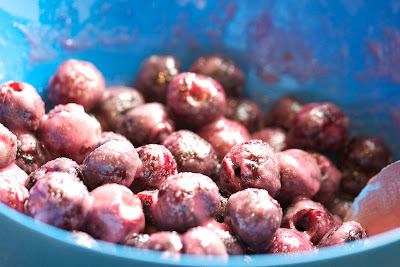 When my boys were younger and were unable to "remove" the pits from the cherries while in their mouths I used to cut them in half to do it. A pitter would have come in handy then and probably still would now.